Defence Pest Management blogs for Pest Control Management in Brisbane. Read more to learn tips and guides for Pest control. Here at Defence Pest Management, we think that it is important that we understand the habits of termites and their biology. 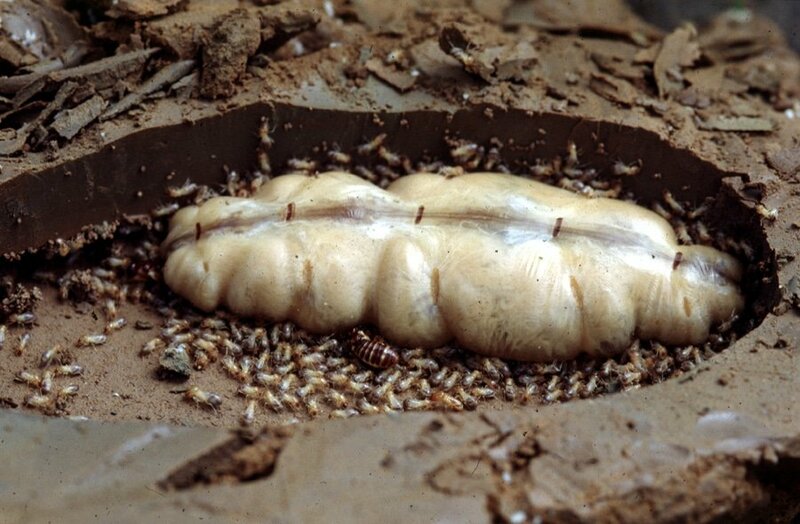 Termites are similar in behaviour to ants and bees. Within the colony, there are several different levels of social structure. These castes are all very important for the maintenance, defence is species dependent and may vary from a few hundred to a few hundred thousand and sometimes into the millions. Within the colony, the individual groups or castes has a specific duty, i.e. the workers work is to build the nest while soldiers defend the nest. The reproductive’s, king and queen, ensure the survival by producing more workers and more soldiers. They even produce young reproductive’s that take to flight once or twice a year to create new colonies. The soldier castes are important for us as pest managers, for it is the soldier caste that allows us to identify the termite species. We can then evaluate the risk of termite infestation and possible economic loss. Then just to complicate matters a little bit further, the pest controller needs to understand whether they are dealing with species of termites that only have one nest or a species that has many nests. The life cycle of the termite is, king/queen who produced the eggs that hatch to form nymphs these developing nymphs than in turn may form supplementary reproductive’s, the worker-soldier or developing alate. Alates are wing termites that we see most commonly in Brisbane in the early summer when the storms are developing, and there is high humidity. It is not uncommon for our telephone to start ringing early in the morning with concerned homeowners about the termites they have found walking around the bath or floor. These alates are very poor flyers and are attracted by light. As I said earlier is very difficult for a termite colony to develop and survive and normally inside a well-constructed home it would be impossible, but it does serve as a good reminder to homeowners to have an inspection. A new colony can be established from young reproductive’s that have taken the flight. These winged reproductive’s look to establish a colony in a suitable location with a very specific set of circumstances required not only for the establishment of a nest, but it’s long-term survival. These circumstances will include a good water source decayed timber and then an abundant source of timber. Very few of the tens of thousands of termites that are released from colonies successfully establish a colony and then only one or two percent of these go on to survive long-term. The original king and queen can have a lifespan of more than 20 years. As the vitality of their egg laying declines, they may be replaced by supplementary reproductive is thus ensuring the survival of the colony. Workers are blind, and the most numerous. Their role in the nest is the collection of food, construction, maintenance of the nest, work in the nursery and look after the king and queen. For pest controllers, the workers are very important for treatment. When termiticide dust or foam is used, it is most important that the largest number of workers are treated because these workers will take the toxic ant back to the nest destroying the King and the Queen, and hence the nest. As mentioned earlier soldiers defend the colony, they are unable to feed themselves, and this is very important when it comes to some treatments. The number of soldiers present, relative to the number of workers, changes when termite colonies are treated and this is an indication of the progress of any termite elimination. 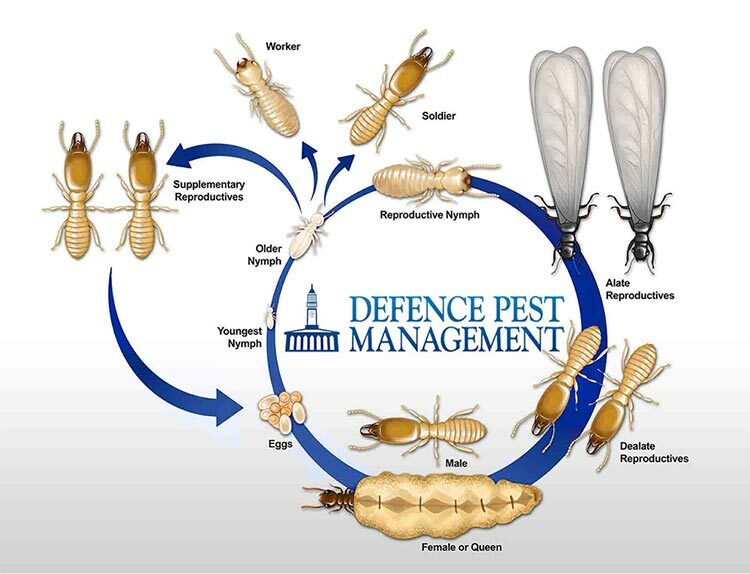 At Defence Pest Management, part of the training of our technicians is that we instill in them a good understanding of the biology of the termite and the termite nest. This transfers into good inspection processes being undertaken for you, the homeowner, because we understand how termites work and live, and how they can gain entry into your home or building. This knowledge of their biology allows us to recommend the most suitable treatments to protect your most valuable asset. With this knowledge and understanding of termites and thus using the most suitable treatment, not only are we protecting your valuable asset, we are also protecting your well-being by no unnecessary treatments. When you combine this with a well-trained technician who understands how houses are constructed, how termites can enter a building, and bypass physical or chemical barriers – you are sure to get the most efficient recommendations for termite treatment. When the technician understands the species of termite, he will successfully and with authority, make recommendations for treatment. This is important. We have found other companies only treating one nest in a species of termites that are multi-nesting. Yes, the nest has been destroyed, but the risk to the property has not been reduced. Conversely, we have seen unnecessary and expensive treatments around properties where the destruction of a single colony is all that was necessary. As part of our training at Defence Pest Management, all our technicians regularly attend various seminars and training courses in the latest procedures and products. 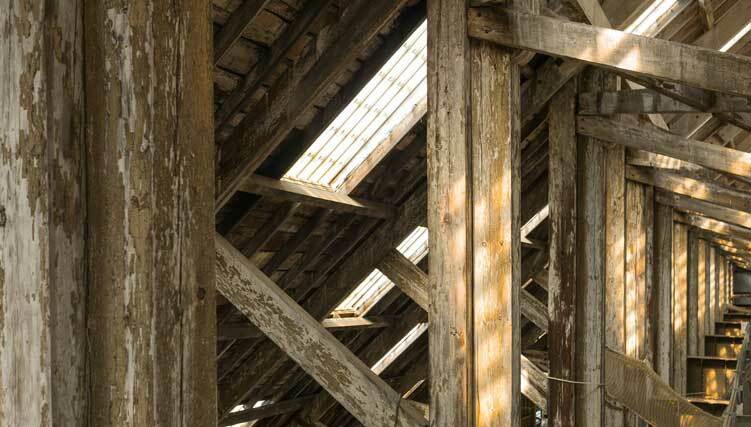 We keep up-to-date with the latest building processes and construction methods as we have an understanding how termites may enter a dwelling or building, and once inside, how it is likely to cause damage. Again, this knowledge and training are vitally important in the treatment process where unnecessary treatments can be kept to a minimum. It is vitally important to understand the weak points in a home over the edge of the slab, entry via plumbing protrusions through the slab or via control joints in brickwork or slabs. Split-level houses have their treatment issues that need to be dealt with. This article is not designed as a treatment blueprint. If you suspect you have termites, it is essential that you call a Defence Pest Management. Fruit flies are a nuisance. Imagine yourself enjoying a meal and then suddenly, you are being swarmed by tiny insects trying to have a taste of your food. Australia is home to over 1500 species of bees. 10 of these are stingless, honey-producing bees such as Tetragonula (formerly known as Trigona) and Austroplebeia. Perhaps when asked which is the oldest pest to ever roam the earth, many of you would say, “cockroach”. Old? Yes, that’s true. After all, they’ve been in existence since around 320 million years ago, back when dinosaurs roamed the earth. But the oldest? Nah… It’s the silverfish. Deciding on what to plant and what not to plant in Spring is not much of an issue anymore since we all know the weather allows us to plant ‘almost’ anything we want.